Jul 31, 2014 | Got Insurance? A bobcat construction operator is uninjured, while a man who was standing on top of the bobcat suffered critical injuries in a mid morning construction accident in Bel Aire Kansas, near Wichita. Authorities say a 38-year-old construction worker landed on his head when he fell from the top of a bobcat. The worker was lying on the ground next to the bobcat when emergency crews arrived on the scene. The injured man was stabilized and transported to the hospital for a work related injury. Read more on www.kwch.com and see video footage of the bobcat construction accident site on www.kake.com. 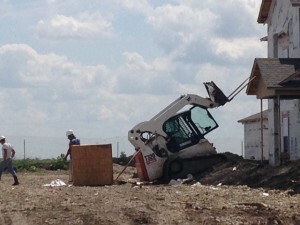 Workers compensation and possibly general liability coverage would be needed for this bobcat construction accident. By the looks of the photo, the construction site was a major remodel apartment building or new construction – both require insurance for workers. If the injured worker was the owner of a business he will likely be excluded from the policy – and not covered by workers compensation. In that case he would need personal medical insurance, and an Aflac type policy to cover him while he recovers from his injuries and returns to work. A bobcat construction company, contractor or subcontractor of any trade can compare insurance rates instantly – and see price examples – at contractor.idealchoiceinsurance.com.